With literally thousands of wild animals including many on the endangered species list, its no wonder that San Diego Zoo is world famous. With more than 4,000 animals representing 800 species, San Diego Zoo is home to a diverse collection of animals, many of which are rarely seen at other zoos. With mobile tickets, simply scan your phone for direct entry into the San Diego Zoo. Come meet the newest addition to the panda family, and the fifth baby panda born at the San Diego Zoo! This is truly one of the most unique and most beloved species on the planet - and very few are ever seen outside their native habitat in northern China.The San Diego Zoo is highlighting California animals from the ancient past, present and future in The Harry and Grace Steele Elephant Odyssey, the newest and most unique exhibit to date! At the Elephant Odyssey, step into the fossil dig site and explore prehistoric fossil evidence, and visit the habitats of current wildlife species including elephants, a pair of lions and a jaguar! Learn about extinction causes of the mammoth and saber-toothed tiger and stop by the Pleistocene playground to find out about conservation projects at work.Activities available at San Diego Zoo include (additional costs may apply): • Guided Bus Tour: A 35-minute tour by double-decker bus covering 75 percent of the San Diego Zoo. Your ticket also includes use of the Express Bus which allows you to hop on and off at 3 different stops throughout the Zoo. (included) • Skyfari Aerial Tram: Take an airborne shortcut over the treetops to the other end of the Zoo and enjoy spectacular views of the Zoo, its animal and plant collection, and surrounding Balboa Park. (included) • Balboa Park Miniature Railroad: pulls out of the station for 3-minute rides around a portion of Balboa Park. (approx. $1.75) • 4-D Theater: If you haven’t experienced 4-D, it’s a film that you can see and hear but also feel, smell, and sense. Wind in your face, snow on your head, a pat on the back—it’s like you’re there, part of the action! This new attraction is located near the western terminal of Skyfari. Guests can purchase tickets at the entrance or at the theater ticket booth. (approx. $6)Make sure to visit the Conrad Prebys Australian Outback exhibit which showcases some of the wonders from the Land Down Under. Venture through a eucalyptus grove and discover species from wombats to wallabies and kookaburras to cockatoos. The Australian Outback exhibit culminates at a Queenslander house-style care center that overlooks a forest for the Zoo's Queensland koala colony - the largest koala colony outside of Australia.Don't miss your chance to see the adorable new Panda cub Xiao Liwu ("Little Gift"). He is on display (weather permitting) from 9am to noon daily. 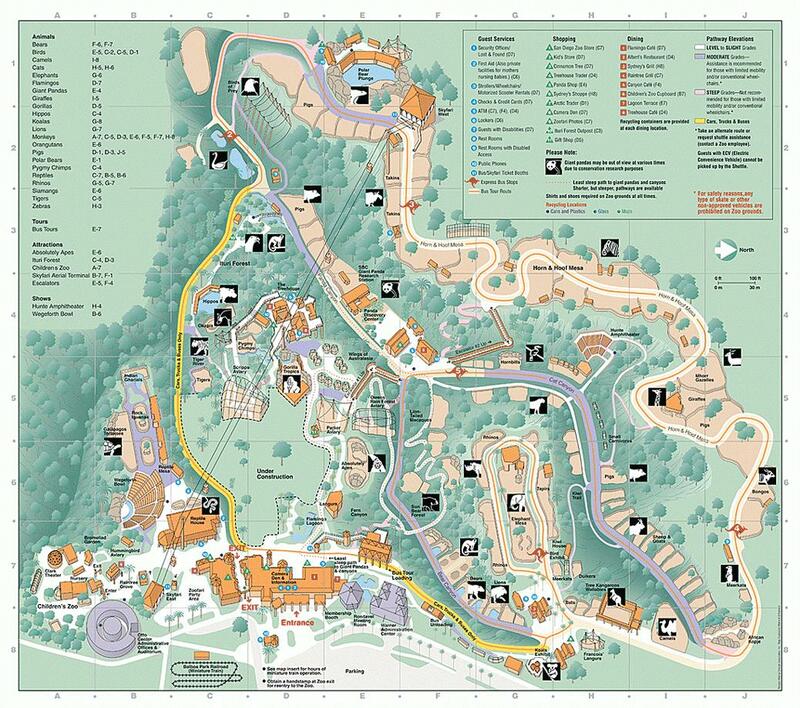 With mobile tickets, simply scan your phone for direct entry into the San Diego Zoo.